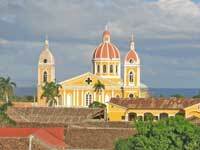 Granada is one of Nicaragua most important cities and the country's main destination for international travellers. For centuries it has been called 'The Great Sultana' in recognition of its beautiful colonial architecture. 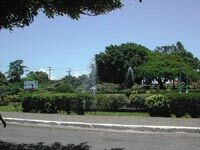 Granada is 40 Km South East of Managua and less than 30 Km from the capital city's international airport. It is an excellent starting point for exploring some of the main attractions in Nicaragua and the neighbouring Costa Rica, from active volcanoes to unique cloud forest ecosystems, from the beautiful islands on Lake Cocibolca, or Nicaragua , to the endless beaches of the Pacific Ocean where every year, between August and December, thousands of turtles lay their eggs. As all colonial cities in Central America, Granada is built around its main square (Parque Central) that represents the city's social, cultural, and economic hub. Around the Parque Central visitors find Granada's cathedral , the city hall, important banks, cultural centres, as well as a myriad of small shops and stalls selling traditional food and handcrafts. A few block to the West of the main square is the central market. There, reasonably priced tropical fruit, fresh vegetables, meat, cheese, and freshly caught fish from the lake are sold on wooden stalls since the earely hours of the morning. The best way to explore Granada is on foot, wandering along its narrow streets. Explore the most remote corners of this fascinating city and have a quick look inside the 'casonas' (the large colonial houses). You'll discover their lovely inner patios, filled with tropical plants, and the shadow of their rooms, furnished with the characteristic rocking chairs. One of the most important Granada's avenues, know as 'La Calzada', starts on the left side of the Cathedral and runs all the way to the lake. La Calzada is flanked by large colonial houses (casonas) and historical buildings, such as the church of 'La Virgen de Guadalupe'. At the West end of La Calzada, runs the lakeshore, or 'malecón'. It is a lovely, recently remodelled boulevard, refreshed by a virtually constant breeze. At the South end of the malecón is the 'Centro Turístico', or Tourist Center of Granada, an area of restaurants, discos, and beaches.